On Sunday Nov 15, Learning2gether celebrated its 300th episode on the 2nd day of the SLanguages conference. 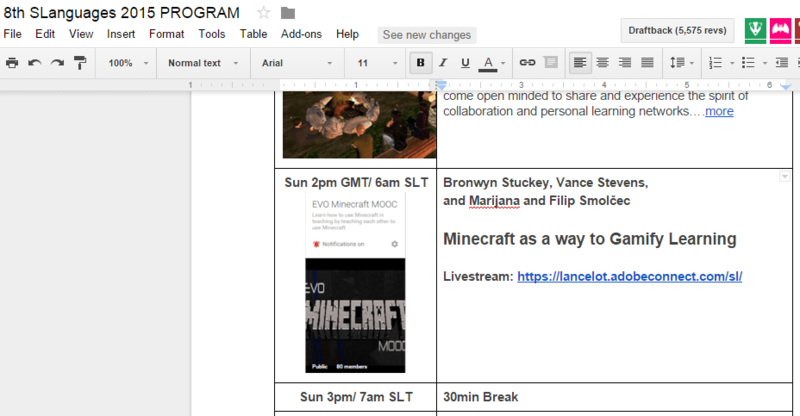 Under the skillful wizardry of Heike Philp, four co-moderators of the proposed EVO Minecraft MOOC session met in Adobe Connect, where Bron Stuckey and Vance Stevens introduced Minecraft, explained its pedagogical significance and appeal to young learners, and extended that appeal to teachers using Minecraft as a vehicle for understanding gamification in the course of their professional development. Filip and Marijana Smolcec, also with us in Adobe Connect, shared a screen where young Filip proceeded to demolish forests for resources and build a shelter as night set in, which he survived despite giant spiders overhead, and emerged at dawn to watch them burn. This and in fact all recording links from the SLanguages conference are available in this post, and below you can find a YouTube embedded recording of Shelly Terrell’s presentation on badges given as an EVO Moderators training session just prior to the Slanguages event. 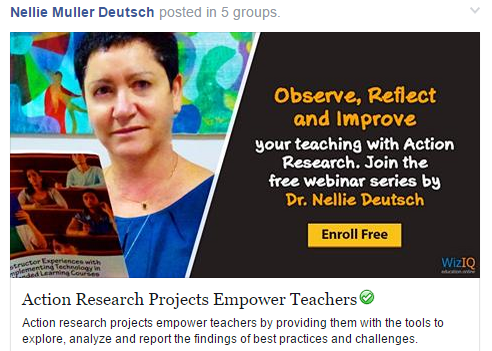 Electronic Village Online is an annual 5-week event sponsored by TESOL where teachers share expertise with one another through carefully crafted professional development training sessions. 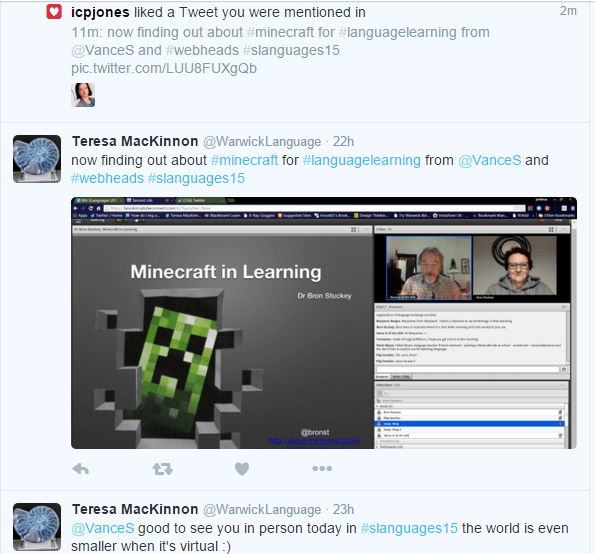 In 2015 one of the new sessions was Minecraft MOOC, which proved so stimulating to its participants that another is planned for 2016 with an expanded panel, including two of the presenters of this SLanguages event. Dr. Bronwyn Stuckey spoke about teacher use of Minecraft and its popularity with young learners. She explained what Minecraft is and what it looks like in learning, mentioned case studies of teachers using it in learning, and showed how teachers can use Minecraft to gamify their curriculum. Vance Stevens examined what teachers (who, in EVO, are learning about the game through the experience of playing it as learners) are learning about designing worlds within the game that will meet their curriculum objectives and create an engaging and enjoyable experience for learners. The presentation explored how teachers can be made aware of the affordances of Minecraft by creating such spaces for one another and interacting in those spaces with young learners who in effect become their teachers. Marijana and Filip Smolčec shared a view from in-world Minecraft, Filip at the controls, showing us how to accumulate resources, survive a night, and emerge in the morning to watch the spiders and creepers burn. Our presentations showed how Minecraft can be adapted to a range of learning contexts including languages, particularly English. The game lends itself to task-based language learning, as all players are by definition builders, and also in that all players can be story-tellers who act out and record narratives set within the game in ways that engage them to develop their language skills. The transcript is too long to be pasted here. Scrolling through it on a mobile device is like spinning a roulette wheel with your thumb. All experts in the field of innovating teaching and learning of languages in virtual worlds are invited to contribute their own professional or academic efforts and to present them in a scientific paper and presentation. Submission deadline 15 October 2015. SLanguages Annual Symposium takes place for the 8th time on EduNation in Second Life and is dedicated to language teaching and learning in virtual worlds. It is free to attend and all of the sessions will be streamed and recorded in Adobe Connect. One of the highlights of this year’s conference will be a film festival on machinima created by language educators during the CAMELOT project. This is to announce that the recordings of the 8th SLanguages Annual Symposium are now available on the SLanguages.org website under http://slanguages.org/program-overview-2/. We enjoyed a breathtaking 28h program jam packed with the latest in virtual reality (VR) and virtual worlds (VWs). Amongst others we explored 7 different worlds: Unity3D, ActiveWorlds, Escape sim in Digiworldz (OpenSim), Edmondo (Opensim), Minecraft, AvayaLive™ Engage (formerly web.alive) and of course our great locations in Second Life. We managed to livestream all of these different worlds, so that the conference participants were able to see everything through Adobe Connect which in itself premiered the first triplecast ever: a share pod in Adobe Connect screensharing Unity3D on Gord Holden’s desktop, me screensharing Second Life on my desktop and Adobe attendees were able to see both worlds on their screen. The Second Life window showed Gord’s head with his lips move when he was speaking, like a 3D webcam. Very funny. I am especially proud of this technical masterpiece because at VWBPE conference, they also explored different 3D environments but everyone had to create accounts, wait for approval, download virtual world software, download and install audio streaming software, cope with new complex interfaces and I wanted to save our participants the disappointment which happened to me, managing only to hear the last 5min of my beloved keynote speaker. We had a great list of true experts in virtual worlds present their latest developments and their presentation were greatly enriched by a whole long list of machinima showcasing teaching in action, artist work and documentaries. Don’t miss out on watching these machinima (all listed on program) as well as the recordings – a truly stunning multi-media experience. and Virtual Round Table will be back again end of April, for the 8th time after a one year break. 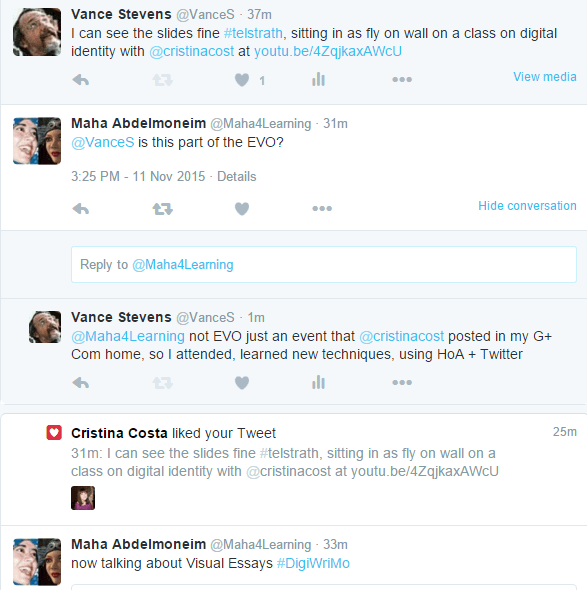 At this tag you can find samples now of Cristina’s students’ digital essays, linked from there in attractive display. What a thoughtful way to showcase your students’ work. Rita is just back from Dublin where she attended Digital Ireland 2015. 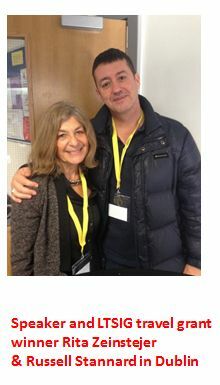 There she met Russell Stannard and gave a reduced version of the presentation she intends to expand on here. Her slides from Dublin appear below.